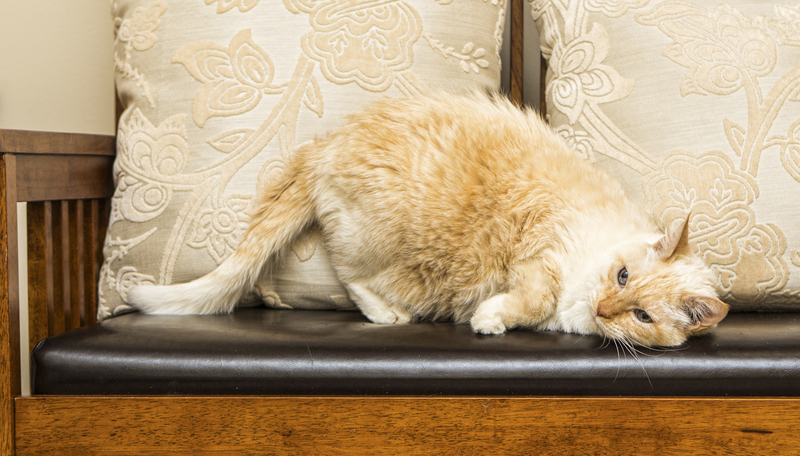 In honor of National Answer Your Cat’s Questions Day on January 22nd, we asked our clients to take a moment and think about what their furry felines would want to know regarding their own behavior and health, and why their people act like they do. Dr. Boyle has provided answers to some of the kitty queries. 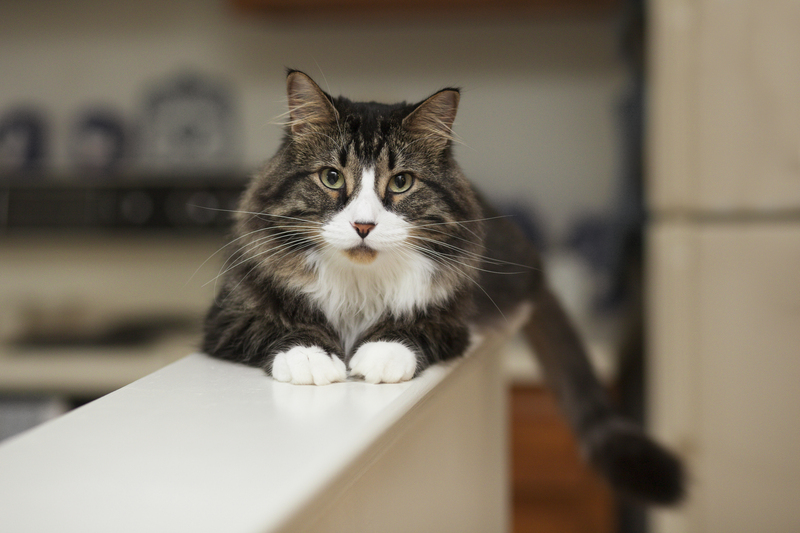 We hope these questions and answers help you be more mindful of your cat’s behavioral and health issues. I’m so warm and cozy in my house. Do I really need to go in my carrier and visit the vet for an annual exam? Annual exams (We recommend semi-annual exams for senior pets over the age of seven) are extremely important for all species—but especially cats. Cats are masters at masking disease and pain until it is very advanced. Our veterinarians are very skilled at picking up early signs of disease; we can recommend monitoring lab work to keep your kitty happy and healthy for as long as possible. For our more anxious feline friends that get stressed at exam time, we have a solution for you too! 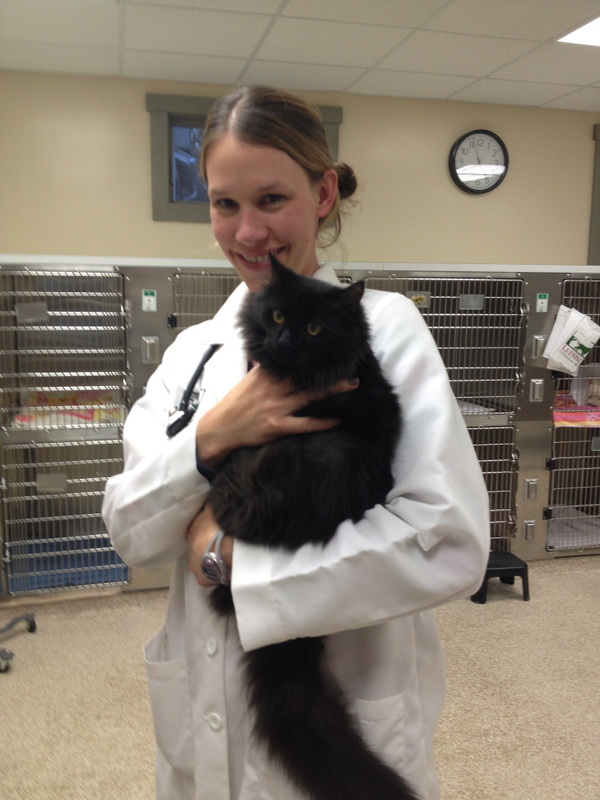 Leesburg Veterinary Hospital is proud be a Fear Free and Feline-Friendly Practice. This means we’re implementing methods and protocols that reduce stress or remove anxiety triggers, which creates an experience that is rewarding and safer for all involved. Watch below as Dr. Boyle gives her tips for reducing anxiety before, during, and after your cat’s exam. Yes, our cozy house is great, but sometimes I really want to go outside to roam and hunt. Why do you keep me inside? 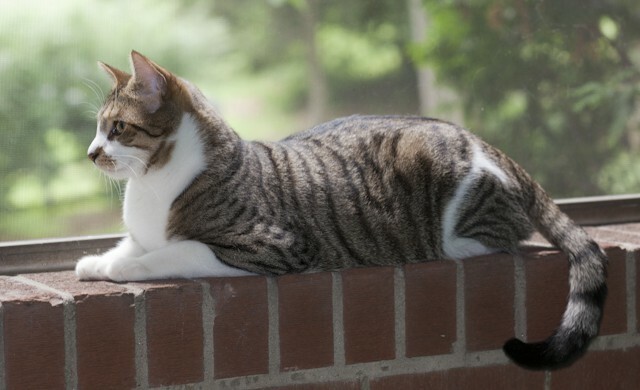 Outdoor cats are at high risk for trauma (getting hit by cars, high falls, etc. ), animal fights (everything from other cats to raccoons and coyotes), infectious diseases, and parasites. It is much safer for our furry felines to live the life of luxury indoors! If I must stay inside like you say, why do you insist on putting that topical preventative on me every month? Leesburg Veterinary Hospital highly recommends all cats be on a monthly preventative (we recommend Revolution) to protect against several ecto-parasites (fleas and ear mites) which can ride in on the humans or other animals, endo-parasites (roundworms and hookworms) that can be found on shoes or in the potting soil of those indoor plants, and heartworm disease transmitted by those mosquitoes that sneak into your house. When I’m not feeling well, wouldn’t it just be easier to take some of your over-the-counter medicines like aspirin or antacids? Why do I need a veterinary-prescribed medication? Cats are very sensitive to medications and even essential oils. It is very dangerous to think they can have human or dog medications. It is always best to check with your veterinarian before giving or applying anything to your cat. I love my “fishy” breath, but you’re always scrunching your nose when I give kisses, saying my mouth stinks. What’s going on? While some of the odor in your cat’s mouth may be due to the odor of their food, there is also a strong possibility that it is due to some degree of dental disease. Bacteria thrive in inflamed gums and in the chunks of tartar on teeth, which creates bad breath (halitosis). Part of your kitty’s annual exam will include evaluating their dental health; we will make recommendations to maintain their health, keep their mouth pain free, and to improve their breath! 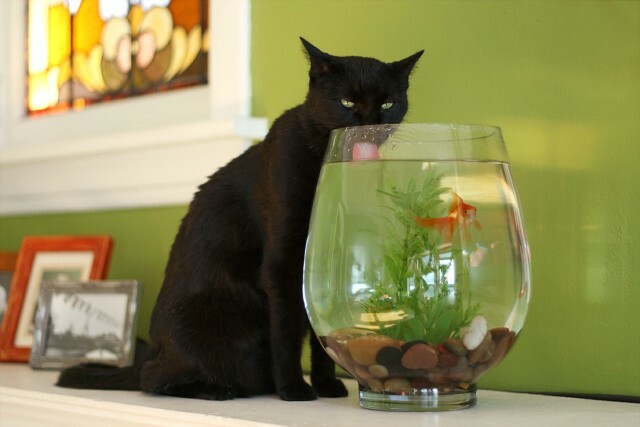 Why would my cat drink out of the fish tank? I think this frisky feline is just a very smart cat and knows how important hydration is for our kitty housemates. It is important to encourage good hydration by providing fresh, clean water for them at all time. This maintains or can improve their kidney, urinary tract, and GI tract health and comfort. Why does my cat keep pooping outside of the litter box? Make sure the box stays clean. Ideally the box should be cleaned out at least once a day but twice a day would be best. 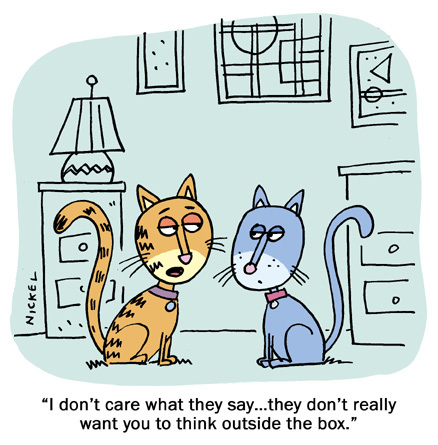 Cats may not want to defecate if urine is lingering in the box. We encourage you to discuss your cat’s health and behavioral questions with your veterinarian at your next exam. The doctors at Leesburg Veterinary Hospital are happy to address your concerns relating your feline’s behavior, health, nutrition, care. 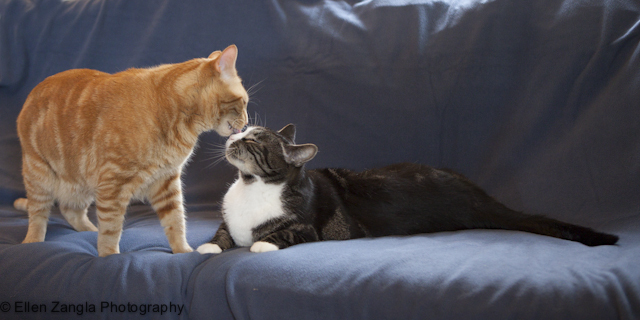 All of the beautiful cat portraits shown above are courtesy of our talented friend Ellen Zangla.